This page shows the latest HealthKit news and features for those working in and with pharma, biotech and healthcare. 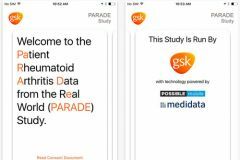 The PARADE App integrates with Apple's HealthKit and ResearchKit. The HealthKit developer tools were launched two years ago to integrate new apps into the iPhone's Health platform. The open source software was first announced last month and builds on Apple's earlier set of app developer tools called HealthKit and its medical research-focused ResearchKit platform. management through home health monitoring devices that securely store data in HealthKit. data collection and analytic capabilities offered by IBM's Watson, Apple's Healthkit and Microsoft Health Vault. Released earlier this year as a build on the company's HealthKit software - it enables scientists to generate applications that can act as a conduit for medical research. data collection and analytic capabilities offered by IBM’s Watson, Apple’s Healthkit and Microsoft Health Vault. HealthKit, a platform developed by Apple, serves as a bank for these patient-generated data. ... Apps available through HealthKit can track users’ health and allow doctors and patients to remotely monitor chronic diseases, such as diabetes and asthma.